Michelin is extending its award winning CrossClimate range into light truck and van with the launch of Agilis CrossClimate. It is a summer tire with a complete winter capability, and heralds a new generation of high performance van and light truck tires with no mobility compromises in winter conditions as well as on mud and grass; tires boasting high mileage and low TCO (Total Cost of Ownership), safety in all weathers, robustness and damage resistance. The new tire is designed and conceived from end-user feedback gathered over the last 10 years, and delivers their two crucial demands – a single tire fitment that delivers all year round mobility in all weather conditions with a robust and damage resistant sidewall. It does this with a rugged tread pattern, made with innovative new rubber compounds and specific new features for sidewall and shoulder protection. As a consequence of the boom in online shopping, and the large increase in local neighbourhood deliveries and heavy vehicle restrictions in towns, the van and light truck is among the fastest growing vehicle segments for new vehicle sales. Additionally, customer expectation on business owners, craftsmen and fleet managers to ensure allyear round availability of deliveries and services, on time, whatever the weather conditions, saw the All-Season van and light truck tire market increase by 37 percent between 2016 and 2017. A single long-life tire, bringing excellent grip, traction and reliability in all seasons, through all weather conditions and on all road surfaces. Robustness and damage resistance; particularly in urban environments with frequent impacts with kerbs and other objects. The 3PMSF marked Agilis CrossClimate tire is certified for use in snow conditions, but still behaves, brakes and lasts like a summer tire on dry roads. This is due to the latest rubber technology; compounds which deliver rubber and tread flexibility, even at freezing temperatures and a multilayer tread area which minimises heat transfer through the tire. Inspired by the award winning* CrossClimate+ car tire, the tread pattern is V-shaped, and is an innovative combination of high-tech tread blocks. These contain bi-directional self-locking sipes to provide cutting edges which bite into snow and ice; for optimum grip on difficult winter surfaces. This combination of new tread rubber and the V-shaped tread pattern deliver grip in all conditions, but also an increase in tire life which is 35 per cent** more than the average of premium competitors tested. The increased damage resistance demanded by users is achieved through the addition of 1.5mm deep trapezoidal blocks around the shoulder and upper sidewall. These – and the rubber they use – are features taken from Michelin’s military all-terrain truck tire range and give added protection, without compromising casing flexibility. The Agilis CrossClimate has been developed and rigorously tested in challenging winter conditions by the Michelin winter tire testing team in two European locations, 4,000 kilometres apart. These are Ivalo, high up in the Arctic Circle in Finland and Barcelonnette at 2,715 metres altitude in the Alps – one of the highest roads in Europe. Tested and developed in these challenging conditions, you can be sure that if the new Agilis CrossClimate can survive these tests, then a suitably equipped plumber coming to repair the heating, or delivery driver with that special gift, will be there – right on time! 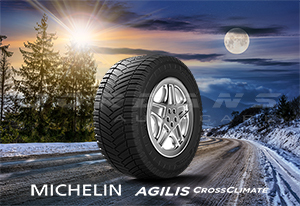 The Michelin Agilis CrossClimate is not just another all-season tire, it offers all the advantages of a Summer tire in wet braking***, dry braking, longevity and fuel efficiency, and the advantages of a Winter tire in traction and braking*** for customers driving in cold or occasionally snowy conditions.